(a) Using a plastic-faced hammer, tap in 2 new ring pins until they stop. 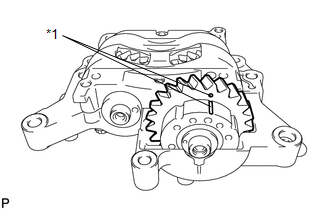 (a) Check that the alignment marks of the balance shaft damper cover and balance shaft driven gear are aligned. If the alignment marks are not aligned, realign them. (1) Place a wrench on the rear cutout part of the No. 2 balance shaft and secure the shaft in place. 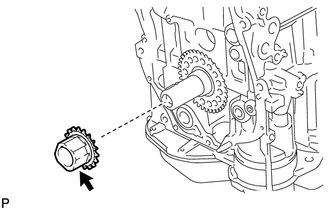 (2) Rotate the balance shaft driven gear of the No. 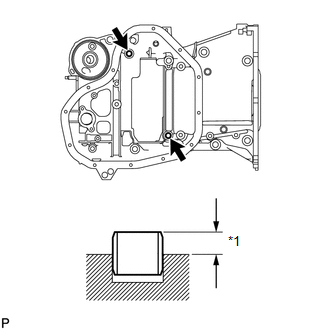 1 balance shaft counterclockwise to align the alignment mark of the balance shaft driven gear with the alignment mark of the balance shaft damper cover. 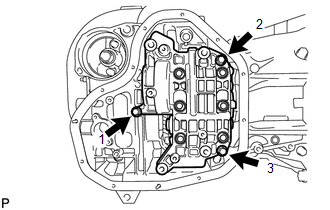 (b) Install the engine balancer to the stiffening crankcase with the 3 bolts, and tighten the bolts in the sequence shown in the illustration. If a stud bolt is deformed or the threads are damaged, replace it. (a) Using an E5 and E8 "TORX" socket wrenches, install the stud bolts. 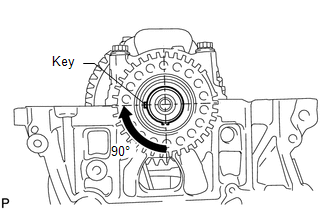 (a) Rotate the crankshaft clockwise so that the crankshaft key is at the position 90° from the bottom as shown in the illustration. 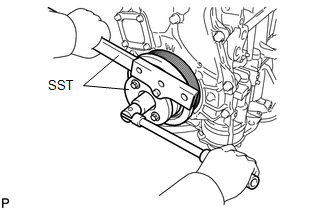 (b) Apply seal packing in a continuous line as shown in the illustration. Remove any oil from the contact surfaces. 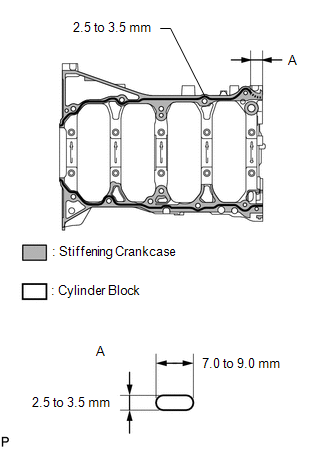 Install the stiffening crankcase within 3 minutes and tighten the bolts and nuts within 15 minutes of applying seal packing. Do not apply oil for at least 4 hours after the installation. 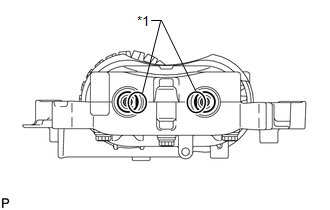 (c) Check that the rear cutout parts are as shown in the illustration. (d) Clean the bolts and their installation holes. 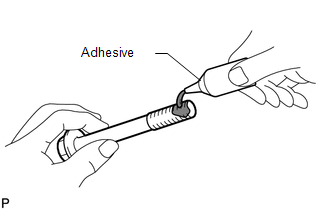 (e) Apply adhesive to 3 threads or more of the end of bolt A. 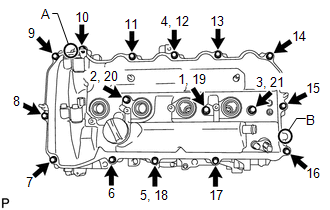 (f) Temporarily install the stiffening crankcase with the 11 bolts. Apply adhesive to bolt A before installing it. 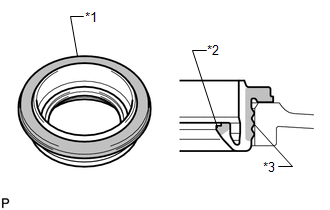 (a) Install the oil pan baffle plate and uniformly tighten the 5 bolts in several steps, in the sequence shown in the illustration. 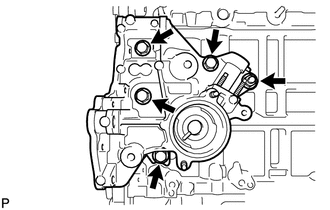 (a) Apply a light coat of engine oil to a new gasket. 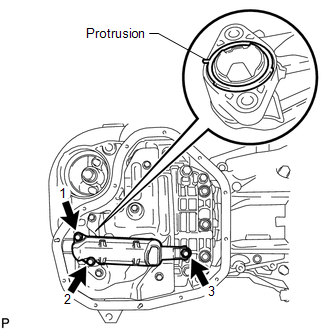 (b) Align the protrusion of the gasket with the cutout of the oil strainer, and install the gasket to the oil strainer. 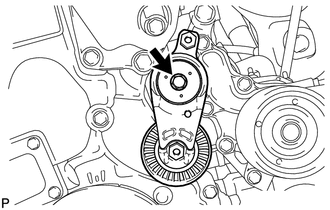 (c) Install the oil strainer with the 3 bolts in several steps, in the sequence shown in the illustration. 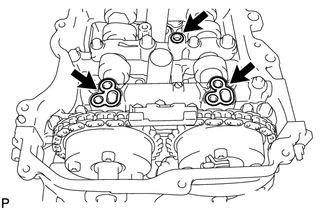 (a) Apply seal packing in a continuous line as shown in the illustration. Install the oil pan within 3 minutes and tighten the bolts and nuts within 10 minutes of applying seal packing. 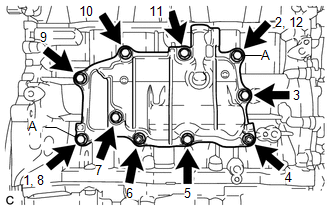 (b) Install the oil pan with the 11 bolts and 2 nuts in several steps, in the sequence shown in the illustration. Bolt A and nut A are tightened twice. 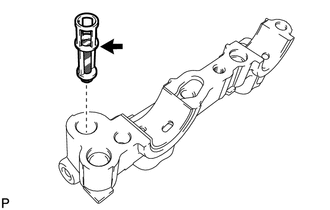 (a) Install the oil filter bracket clip to the stiffening crankcase assembly. 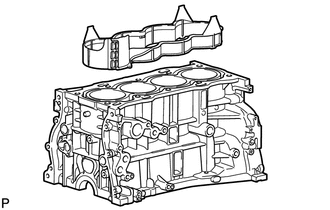 (a) Install the water jacket spacer to the cylinder block. (a) Using a plastic-faced hammer, tap in 10 new ring pins to the camshaft housing. (a) Using a plastic-faced hammer, tap in 2 new straight pins to the camshaft housing. 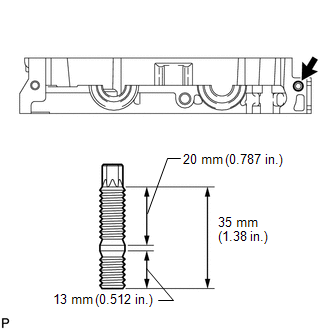 (a) Using an E8 "TORX" socket wrench, install the stud bolt. (a) Clean the No. 1 camshaft bearing. (b) Install the camshaft bearing to the No. 1 camshaft bearing cap. 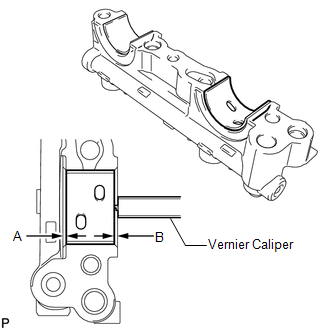 (c) Using a vernier caliper, measure the distance between the camshaft bearing cap edge and the camshaft bearing edge. (a) Clean the No. 2 camshaft bearing. (b) Install the camshaft bearing to the camshaft housing. 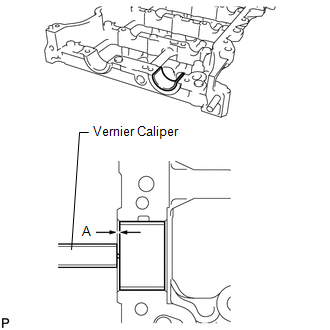 (c) Using a vernier caliper, measure the distance between the camshaft housing edge and the camshaft bearing edge. (a) Install the oil control valve filter to the No. 1 camshaft bearing cap. 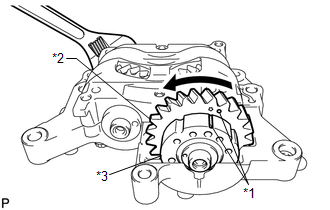 (a) Install the crankshaft timing sprocket to the crankshaft. 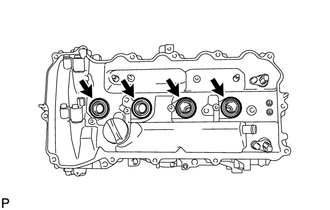 (a) Install a new gasket and the timing chain cover plate with the 4 bolts. (a) Using a 14 mm hexagon wrench, install a new gasket and the plug. 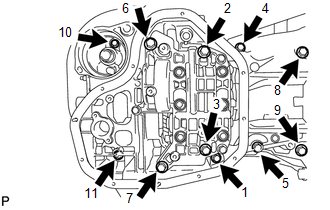 (a) Visually check the spark plug tube gasket. If the result is not as specified, replace the spark plug tube gasket. 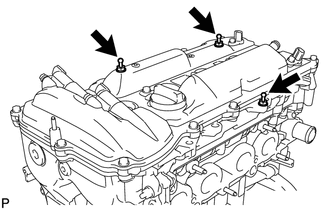 (b) Install the 4 plug tube gaskets to the cylinder head cover. 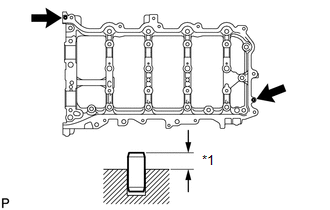 After pressing in the spark plug tube gasket, make sure the gasket protrudes 1.0 mm (0.0394 in.) or less from the cylinder head cover. (a) Apply a light coat of engine oil to 3 new gaskets. (b) Install the 3 gaskets to the camshaft bearing caps. 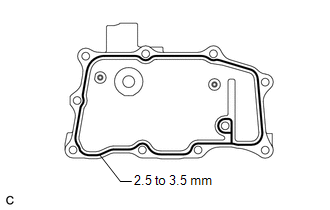 (c) Install a new gasket to the cylinder head cover. 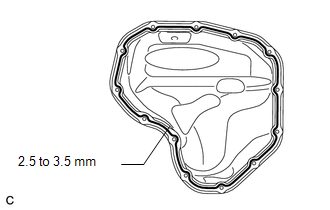 (d) Apply seal packing as shown in the illustration. 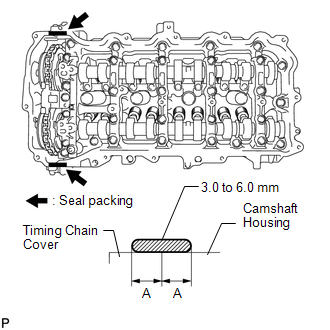 Install the cylinder head cover within 3 minutes and tighten the bolts within 15 minutes of applying seal packing. 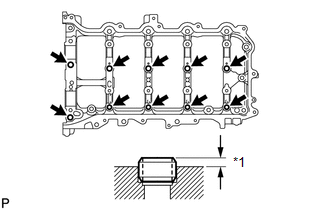 (e) Align the cylinder head cover with pin A. Then align the cylinder head cover with pin B and install the cylinder head cover. 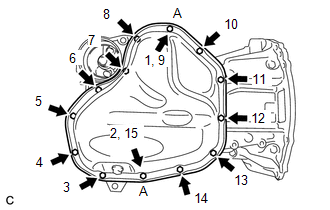 (f) Install 3 new seal washers and the 16 bolts, and then tighten the bolts in the order shown in the illustration. 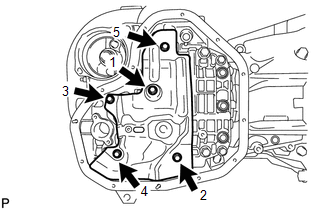 (a) Install a new gasket and the inlet water housing with the 4 bolts and nut. 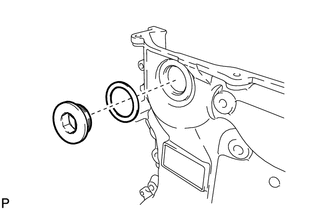 (a) Install the V-ribbed belt tensioner with the bolt. 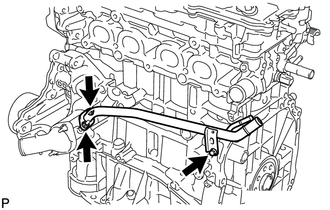 (a) Install a new gasket and the water by-pass pipe with the 2 nuts and bolt. 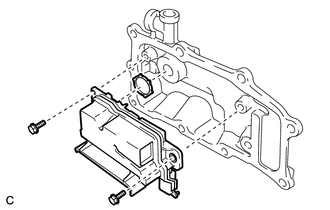 (b) Install the gasket to the separator case. (c) Install the separator case with the 2 bolts. Install the ventilation case within 3 minutes and tighten the bolts and nuts within 15 minutes of applying seal packing. 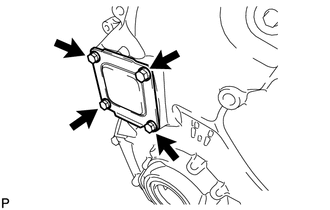 (b) Install the ventilation case, and install the 8 bolts and 2 nuts in the order shown in the illustration. Bolt A is tightened twice. (a) Install a new gasket to the oil filler cap. (b) Install the oil filler cap to the cylinder head. (a) Install the 3 joints.